“The Die is Cast” for Europe and the EU. This is what Caesar said when he crossed the Rubicon in 49 BC marching towards Rome, leading to a major change in Europe’s history. The Italian referendum which took place on December 4 had a similar significance. The Brexit vote in which Britain decided to divorce from the EU started the breakup of the artificial construction of 500 million people being ruled by an unelected and unaccountable elite in Brussels. Even worse is an artificial paper currency, the Euro, which is used by 19 out of the 28 EU countries. All paper currencies are of course artificial constructions that eventually become worthless but to have a currency for 19 countries with different cultures, different growth rates and productivity and vastly different inflation rates is a total disaster. This is why Italy, Greece, Spain, Portugal and many more EU countries are totally bankrupt. These countries have been forced to use a currency which has made them completely uncompetitive and unable to export or function. At the same time, Germany has benefited from a weak Euro which has made their export industries very successful. The referendum in Italy last Sunday changes the destiny not only for Italy but for Europe and also the world. The Brexit vote was the first indication that governments and the elite in the West are totally out of touch with the people. Trump’s win in the US presidential election confirmed the same phenomenon. In Italy, people are fed up with the Renzi government which lost the referendum on the Italian constitution. In itself, the referendum is not that significant but it is seen as a protest vote against the Renzi government. Interestingly, Renzi is the only European leader that officially backed Hilary Clinton and this is likely to cost him dear. Most of the European leaders hated Trump but no one was stupid enough to officially back Clinton. With Renzi losing the referendum and resigning, it will likely lead to an election which the actor Beppo Grillo would win. His party is anti-globalism, anti-establishment and anti- immigration and anti-EU and Euro. In Austria’s presidential election last Sunday, Norbert Hofer lost by a small margin. Hofer is on the far Right and also anti-immigration and anti-Muslims. Many European countries already have Eurosceptic governments like Hungary, Croatia, Poland and Slovenia. In 2017 there will be elections in France where Marine le Pen’s National France is well placed. In Holland the Party for Freedom which is anti EU is also well placed. And in Germany there will also be elections in 2017. There is strong opposition to Merkel due to the major immigration problems that Germany is now suffering, all of Merkel’s making. Italy crossing the Rubicon is yet another confirmation that the trend has changed and that the peoples in Europe are now turning against the establishment and the elite. In addition to the unhappiness in Europe with politicians who are not in touch with the people, there are major problems in the financial system. One of Europe’s biggest banks, Deutsche Bank, is very much looking like Lehman. Both the share price and the derivative position are giving indication of a bank on its way to bankruptcy. And in Italy, the whole banking system is insolvent. It is not just Italy’s oldest bank Monte dei Paschi which is virtually bankrupt but impaired loans for all Italian banks are at least €360 billion which is around 20% of the Italian banking system. Monte dei Paschi is desperately trying to raise €5 billion and UniCredit, Italy’s biggest bank, needs €13 billion. So Europe is in major trouble both politically and financially. When the difficulties start unravelling in Europe, the rest of the world should not feel confident that this is an isolated local problem. The global economy and financial system is totally interconnected and a problem in a country like Italy will have repercussions around the world. Take Deutsche Bank’s derivative position of $50 trillion for example which is around 20 times German GDP and 70% of global GDP. This is not just too big for Germany, it is too big for the world. A problem erupting in Deutsche would spread like wildfire throughout the global financial system. The 5 largest US banks have a derivatives’ portfolio of $1/4 quadrillion at least and probably double that. That is 3.5 times global GDP and obviously too big for the global financial system. There are only two ways to deal with a problem in a financial system which has total derivatives of $1.5 quadrillion on top of already insolvent bank balance sheets. 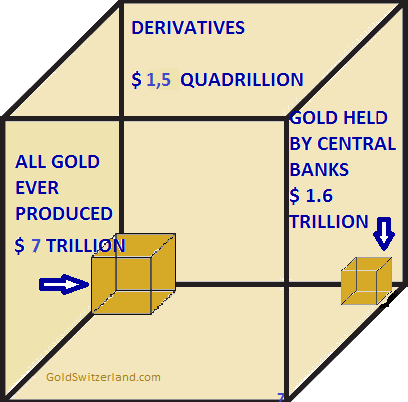 The cube below shows the amount of global derivatives outstanding. $1.5 quadrillion is an astronomical amount in relation to all the gold ever produced or to the gold supposedly held by central banks. These derivatives are just illusory contracts with no underlying real value. The attributed gross value is assuming that an endless chain of counterparties will all settle their part of the chain. 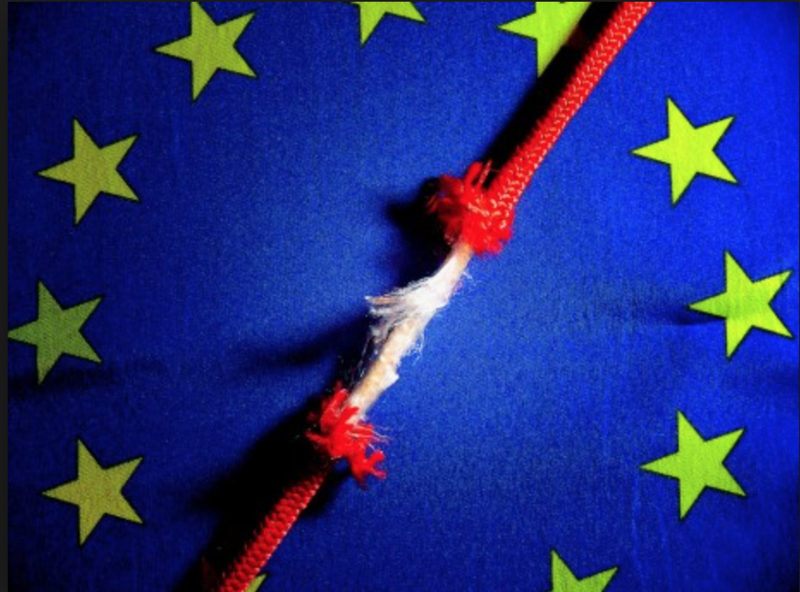 It is sufficient that just a handful of major counterparties fail for the whole daisy chain to collapse. This will result in gross values of 70x global GDP disappearing into a black hole, never to be seen again. When this happens, no financial institution will survive. I would say that the likelihood of such an event is greater than 75%. The catalyst could easily be the European financial system. What happened in Italy last weekend could easily be seen as the shot in Sarajevo, an event that is the trigger for a change in history. In a futile attempt to stop the inevitable collapse, central banks will print unlimited amounts of money. This will lead to a short period of hyperinflation before the financial system, including the currency system, implodes. But since we are talking about a false and corrupt system that manipulates every single market, a collapse of this system will be a godsend and the only way to replace an irretrievably broken system. There is no chance for the world to grow soundly before the current financial system has been wiped off the face of the earth. In my view this must happen and any attempt to save the system will just make the collapse bigger. The fall of the financial system will obviously cause misery and major upheaval for most people on earth but it is guaranteed to happen and is also necessary for the world to start again with real markets and real growth. To summarise, the changes that will take place in Europe over the next year or so, are likely to be one of the catalysts that will trigger the inevitable fall of the financial system as well as the world economy. Obviously at some point in the future, there will be a Phoenix coming out of the ashes of the present system which will hopefully lead to a better world over time. In the meantime, as paper money dies, protecting your assets is now more vital than any time in history. All assets within the financial system will implode. Debt and derivatives will implode under their own weight. All the bubble assets that this debt has supported will also collapse. This includes stocks, bonds and property. Anyone who holds anything within the financial system is likely to lose a major part of their assets. And if anything remains of value, it will take a very long time before liquidators have sorted the mess out in order to pay out pennies on the dollar. Unencumbered assets in the system should eventually be released but this could take many years and there is a major risk that a bank under pressure has used these assets as collateral. The best way to preserve wealth in coming years is to hold unencumbered real assets outside the financial system such as property, land and mineral rights. The ultimate wealth preservation asset is of course gold. Gold is the only money which has maintained its value throughout history. Since paper money will either be very scarce, especially since most governments will ban it, or worthless, gold will become the only real medium of exchange. Gold will be used as money and for barter. The collapse of paper currencies and the financial system will make gold extremely desirable and valuable. The current currency restrictions in India have had a major effect on the gold price. Prices as high as $3,000 per ounce have been seen but currently gold in India is $1,600-1,700. This is a premium of 35-45% on the current spot of $1,177. There are of course concerns that import restrictions will slow down demand. But according to my sources, the rampant corruption in India makes it easy to pay the right official to let the gold in. Indians are now likely to buy more gold rather than less as the Modi government has virtually destroyed the paper currency system. Obviously, there is no premium on paper gold in India. The Indians and the Chinese know that paper gold is worth zero since this market will totally collapse. Also in China, premiums for physical gold have shot up and are at a three-year high. Gold in China is today traded at $24 above spot. 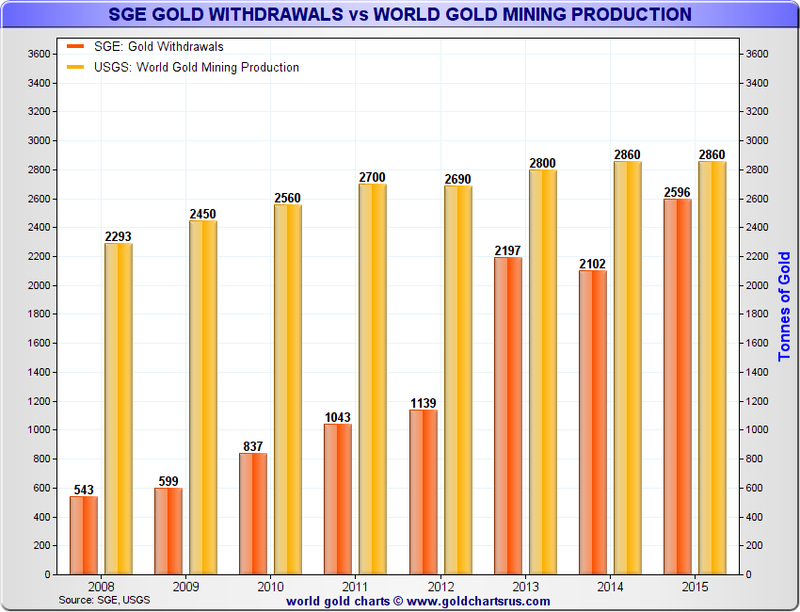 The chart below shows the insatiable demand for gold in China which in recent years have absorbed a major part of world production. Goldmine production is today around 3,000 tons annually. By 2025 it will be down to 2,000 tons as we currently have reached peak gold. The refiners in Switzerland who refine most of the gold bars in the world, report strong demand currently. All the gold that is being produced is mainly bought by China, India, Russia and a few other buyers. There are no stockpiles of unsold gold in the world. But there are piles of paper gold that are at least 100 times greater than the physical gold available to settle the paper gold claims. The paper gold market is corrupt and manipulated by central banks and bullion banks. For the time being, this group has managed to keep gold $000s below the real price that physical gold would fetch without the paper gold manipulation. As the problems in the financial system start unfolding, which could happen at any time, the paper gold market will fail and the real gold price for physical gold will be set by China. Once this happens, gold will climb quickly towards $10,000 in today’s money and then much higher in inflationary money. Short-term, gold in the paper market can always be pushed down another $100. But with a very limited downside and an upside of many thousand dollars, at current levels of $1,175 physical gold is an absolute bargain. It is also the best way to protect your wealth against the coming destruction of asset prices and paper money. Tagged China gold demand, derivatives implosion, European financial system, Monte dei Paschi.